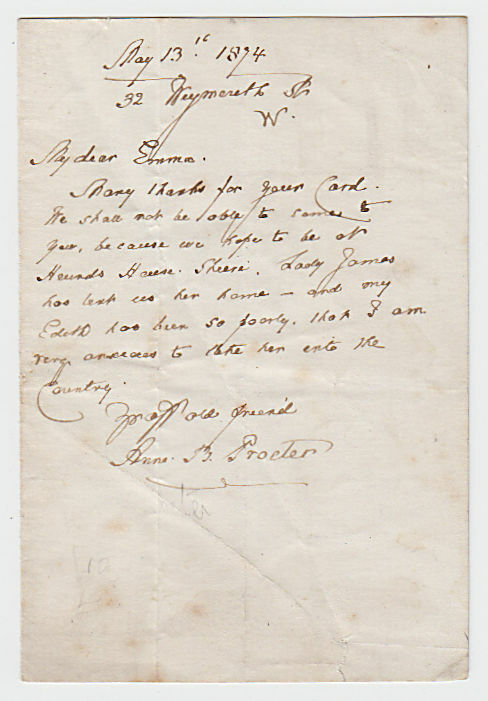 Autograph Letter Signed, to “My dear Emma”, explaining why they are unable to accept the invitation – “Lady James has lent us her home – and my Edith is so poorly”. 1 page 4 x 3 inches, occasional light stains. 32 Weymouth Street, 13 May 1874. Anne Benson Procter [née Skepper] (1799-1888), writer who married the British poet, Bryan Procter (‘Barry Cornwall’). At their London houses. Procter’s sociable and talented wife’s ‘tremendous energy and genius for gossip made her a hostess of distinction’ (Letters and Private Papers of … Thackeray, 1.cliii), so that the Procters’ parties became a long-lived institution of literary London. As a widow, Anne Procter, with the assistance of Coventry Patmore, edited Procter’s An Autobiographical Fragment and Biographical Notes (1877). It was prefaced by verse tributes from Walter Savage Landorand Algernon Swinburne. The Procters’ daughter, Adelaide Anne Procter (1825-1864), was a successful poet.